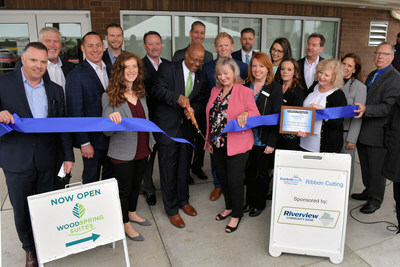 ROCKVILLE, Md., April 10, 2019 /PRNewswire/ -- WoodSpring Suites continues its coast-to-coast expansion with the grand opening of the WoodSpring Suites Portland North Gresham. Located at 3013 Northeast 181st Avenue. in Portland's Gresham neighborhood, the new four-story, 122-room hotel is the brand's milestone 250th property and first hotel in Oregon. WoodSpring Suites hotels offer extended-stay guests a welcoming environment and straightforward stay – all affordably priced. Franchised by Choice Hotels, WoodSpring Suites is the nation's fastest-growing economy extended-stay hotel brand. Each property is newly-constructed and built to anticipate the needs of travelers looking for a longer-term stay. Properties feature all-suite rooms with fully-equipped kitchens, flexible workspaces, and guest laundry facilities. There are more than 250 WoodSpring Suites hotels open in over 38 states and more than 100 in the pipeline across the country as of December 31, 2018. For more information, visit www.woodspring.com/ourbrand/.